Hansen finished fifth in the USA Climbing 2018 Collegiate National Championships held April 20-21 in Houston. Who knew we had one of the country's top collegiate rock climbers on campus? Second-year Business Administration student Ray Hansen of Melrose represented Hudson Valley Community College this past weekend in the USA Climbing Collegiate National Championships in Houston. 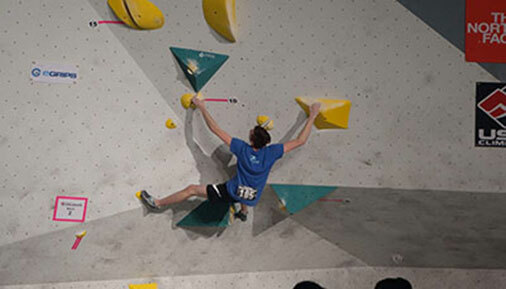 Competing against 200 collegiate climbers in the Bouldering classification, Ray made it to the finals and finished in fifth place overall. Ray says he started climbing as a freshman at Hoosic Valley High School, and the sport's physically challenging yet meditative nature grew on him. "It wasn't really until I had been climbing for a year or so that I got serious about it. It's the only thing I've ever tried to do that works your whole body and your mind," he said. Ray competed with the team from the Halfmoon rock climbing gym, The Edge, in USA Climbing's Youth division for several years, but last year he moved up to the Collegiate division (there is an Open division for all other climbers). While Hudson Valley has never had a climbing team, he only had to prove he was a student in good standing to represent the Vikings in regional and national tournaments. Ray finished no lower than second place in the qualifying tournaments leading up to the nationals, thanks in part to the 30 hours of training he tries to put in each week. That training combined with his school work and a job at The Edge have made past six months "a little crazy." His fifth place finish in the national tournament was good enough to secure a spot on the US team that will travel to Bratislava, Slovakia this June to compete in the World University Championships. With a brand new passport in hand, he's looking forward to the trip and meeting other climbers from around the world. For Ray, that camaraderie is one of the highlights of being part of the climbing community. "Climbing's a unique sport in that, even at the national level, pretty much all the competitors want to see the people they're climbing against succeed," Ray said. "At nationals, I was sitting in fifth place watching someone who, if he got to the top of the climb, would have taken my spot on the national team, but I was cheering him on. That attitude might confuse spectators when they watch a climbing competition for the first time, but we want to see everybody get to the top."